Trump is racist. Here’s a reminder. 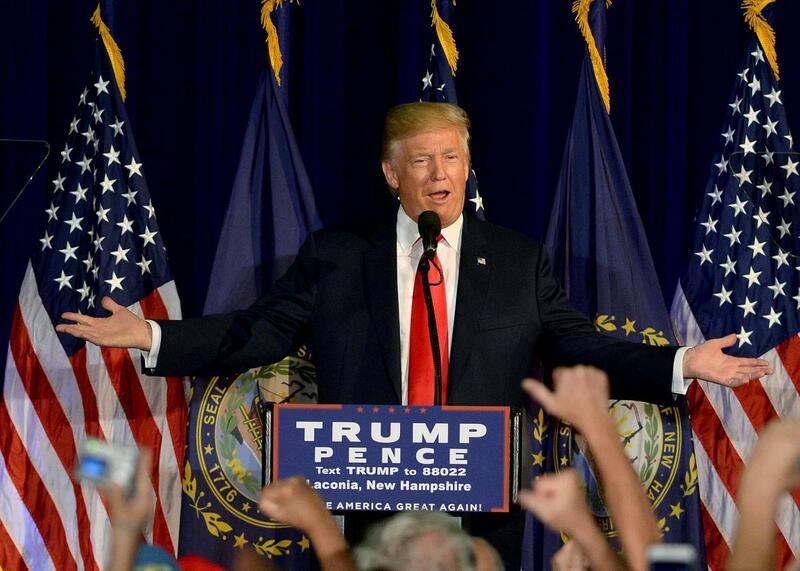 Donald Trump speaks at Laconia Middle School on Thursday in Laconia, New Hampshire. Donald Trump will hold a Sean Hannity–hosted town hall at a black church in Ohio on Wednesday to “discuss the core issues and concerns surrounding African-Americans this 2016 election cycle,” according to Fox News. For that to work, Trump will have to hope they’re willing to ignore his well-documented history of doing and saying racist things. There is, of course, all of Trump’s talk about restoring “law and order” to a country he paints, wrongly, as overrun by violent criminals from the inner city (read: black). And who could forget birtherism, which was very plainly an attempt to delegitimize the first black president in the nation’s history. The first time Donald J. Trump’s name appeared in the New York Times, it was in 1973 under headline: “Major Landlord Accused of Antiblack Bias in City.” According to the Department of Justice, the Trump Management Corp. violated the Fair Housing Act of 1968 by systematically refusing to rent apartments to or negotiate with black tenants. Trump settled the case two years later without admitting guilt, but as part of the deal he was required to provide the New York Urban League with a weekly list of all apartment vacancies for two years. In April 1989, a 28-year-old white woman out for a run in New York City’s Central Park was beaten and raped. Five teenagers were arrested; four were black and one was Hispanic. The case transfixed much of the city and stoked existing racial tensions. As then-Mayor Ed Koch called for peace, Trump called for blood. Within weeks of the incident, he took out paid ads in local papers that blared in all-caps: “BRING BACK THE DEATH PENALTY. BRING BACK OUR POLICE!” The lower-case text that ran below along with Trump’s signature was peppered with lines like this: “I want to hate these muggers and murderers. They should be forced to suffer and, when they kill, they should be executed for their crimes.” The five men spent years in prison before eventually having their convictions vacated after another man confessed to the crime. I’ve got black accountants at Trump Castle and at Trump Plaza—black guys counting my money! I hate it. The only kind of people I want counting my money are short guys that wear yarmulkes every day. Those are the kind of people I want counting my money. Nobody else… . Besides that, I’ve got to tell you something else. I think that the guy is lazy. And it’s probably not his fault because laziness is a trait in blacks. It really is; I believe that. It’s not anything they can control. The Democrats have failed completely in the inner cities. For those hurting the most who have been failed and failed by their politician — year after year, failure after failure, worse numbers after worse numbers. Poverty. Rejection. Horrible education. No housing, no homes, no ownership. Crime at levels that nobody has seen. You can go to war zones in countries that we are fighting and it’s safer than living in some of our inner cities that are run by the Democrats. And I ask you this, I ask you this — crime, all of the problems — to the African Americans, who I employ so many, so many people, to the Hispanics, tremendous people: What the hell do you have to lose? Give me a chance. I’ll straighten it out. I’ll straighten it out. What do you have to lose? …Right now, you walk down the street, you get shot. Look at the statistics. We’ll straighten it out. The list goes on: Trump tweeted out bogus crime stats last year that wildly inflated the rate at which blacks kill whites, was exceedingly slow this year to disavow former KKK Grand Wizard David Duke, and also has suggested that the Black Lives Matter protesters are just “looking for trouble,” to name but a few. Trump, however, won’t have to answer for any of that in Ohio on Wednesday, since his chosen interlocutor is also his cheerleader, from a network that has perfected the racist dog whistle.